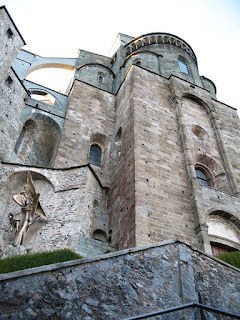 Who does not remember the imposing monastery in Umberto Eco's 'The Name of the Rose' (1980). Both in the novel and in the movie, it loomed dark and forbidden in the story and the landscape. Umberto Eco took great care in weaving fact and fiction together in his story. 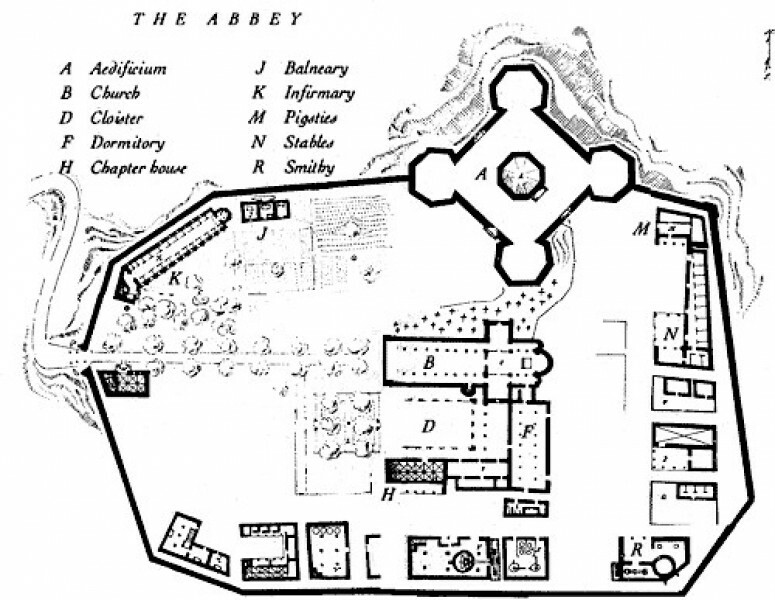 So, the curious among us want to know if Umberto Eco modeled his fictional monastery on an existing one. "Conjecture allows us to designate a vague area between Pomposa and Conques, with reasonable likelihood that the community was somewhere along the central ridge of the Apennines, between Piedmont, Liguria, and France," writes Adso(p3). That's a rather large area and Adso's remark isn't helpful at all. So, what other clues can we find in the story? Let's start at the very end. After departing the ruined monastery Adso writes "We headed east. When we reached Bobbio again. "(p498) Therefore, the monastery must have been situated to the west of Bobbio. Are there any existing once great monasteries that stand west of Bobbio? 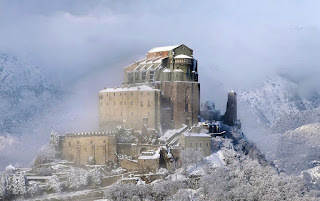 Well, there are a lot of smaller ones, but one seems a very interesting candidate: the Sacra di San Michele, built high on Mount Pirchiriano, looking menacingly down onto the small city of Fonte di San Pietro. 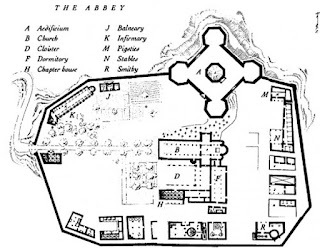 For much of its history the abbey was under Benedictine rule. Situated just 20 kilometers or so from Turin, in the region of Piedmont, it might therefore well have been the unnamed monastery of 'The Name of the Rose'. 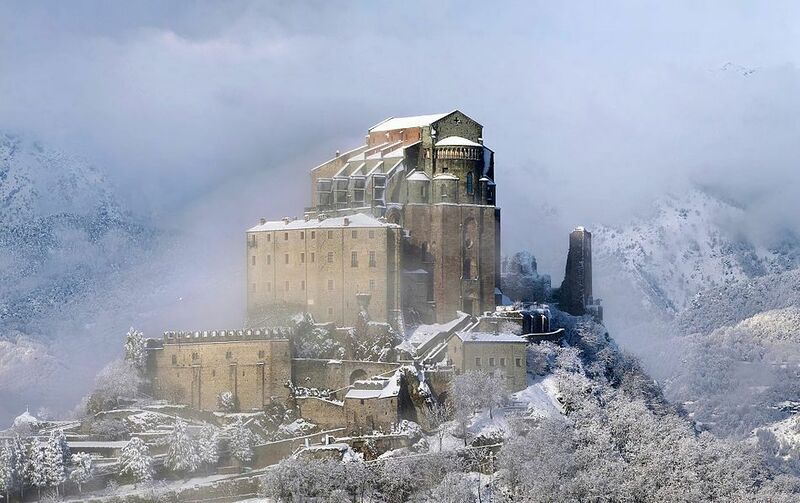 We now have a number of clues that point to the Sacra di San Michele as being the source or inspiration for the unnamed monastery in Umberto Eco's 'The Name of the Rose'. Can we ever be certain? No, but that's the joy and mystery of a (partly) fictional story. An independent site that delivers mostly positive news. Any request for collaboration with a newspaper or magazine from somewhere around the Mediterranean will be viewed favourably. Questions, reactions or suggestions? Want to advertise? Don't hesitate and mail me here. Earliest extract of Homer's 'Odyssey' found? Was Marco Polo born in Croatia? When was the end of the Trojan War? Where was the River Styx situated?